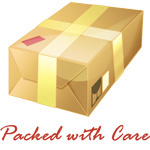 Knowledge Base :: Frequently Asked Questions about Amber - Amber Jewelry Store | Online Gateway to Amber Necklaces, Bracelets, Prayer Beads, Baby Teething Necklaces, Pendants, Amber Stones with Insects and Amber Earrings. There are numerous unknown facts about amber and owners or collectors have a lot of questions. Here are some of the frequently asked questions about Amber. 1. What is a Baltic Amber stone? Baltic amber is a splendid semi-precious fossilized stone created from tree resin. Its origin dates back to over 50 million years, in Northern Europe, where pine trees and extremely high temperatures contributed to the stone's formation process. The tree resin was hardened due to nature's influence and the underground or underwater conditions. 2. How can I maintain my amber jewelry in a good form? You can take care of amber jewelry by cleansing it using fresh clean warm water and drying it with a soft cloth. Remember not to use chemical cleansers, as it damages the stone. Store it in a soft cloth away from other jewelry pieces. 3. What is referred to as amber inclusion? 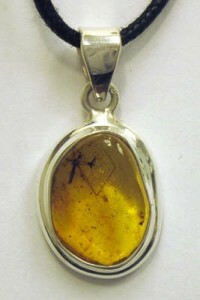 Amber inclusions are organic residuals of flora and fauna embedded inside the amber stone. You can find inside insects, arachnids, small animals, plants, oxygen bubbles and any type of organic residual that was trapped in the resin millions of years ago. These add value to your amber stone. Inclusions with small animals are extremely rare and often seen only in museums. 4. What is the effect of amber inclusions on jewelry? First of all, there is no such thing as a negative effect. 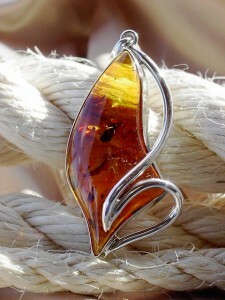 Imagine how much value each inclusion adds to the amber stone. They will only affect positively your jewelry, making it a unique one of a kind piece. 5. How can I tell the difference between real and fake amber? Amber became really famous among jewelers and artisans, so many people try to imitate it in order to make it into the industry. There are three simple methods you can use in order to differentiate the real amber from the fake one. The first one is to test it in salt water, because real amber floats while fake amber sinks. The second easy method is to check its scent: real amber has a sweet, piney scent and it is pleasant when burnt, while fake amber has a plastic, chemical smell. The third way is related to heat: fake amber melts when burnt, while real amber burns and gives a soft piney scent. Also, keep in mind that fake amber is made using surrogate materials such as glass, copal and plastic, so it is easy to distinguish it from the real amber resin. 6. Can amber be used for medical purposes? Yes, amber has a proven record of medical qualities used since ancient times. The Romans believed that amber could protect the wearer from mental illness, infections, kidney stones and stomach diseases. Eastern countries would smoke amber for powerful human resolution and courage, while Chinese people would make amber syrup used for tranquillizers. Amber tincture mixed with vodka would provide men with sexual potency. Today, it is used in aromatherapies as a bio-stimulant for the nervous system. 7. Are there amber myths out there? Yes, there are a few amber myths, most of them in Greek mythology. The most notable one is the story of Phaeton, the son of the Sun-God Helios, who convinced his father to let him drive the sun chariot. Unfortunately, the horses were not bonded with him and felt that he was too inexperienced, resulting in the burning of Africa and blackening its people. Zeus saw everything and was so filled with anger he struck Phaeton by lightning and the boy died. His sisters and his mother grieved for him and cursed the gods. They were punished and turned into trees, but even so, they kept crying. Their tears became the resin of the tree and later on turned into amber. 8. Is there a more valuable amber color? In fact, there is. Contrary to popular belief, amber is not all yellow or brown, but also comes in red, black, blue, green, white and clear colors. The most valuable piece is the clear amber and only one in ten pieces is crystal-clear. 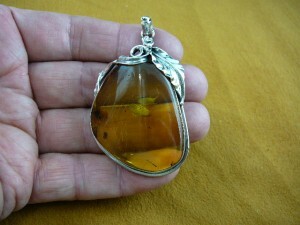 Clear amber allows a better view of the inclusion found inside, so it is extremely pricy compared to ordinary amber colors. 9. Are hand-carved amber figurines and jewelry that special? 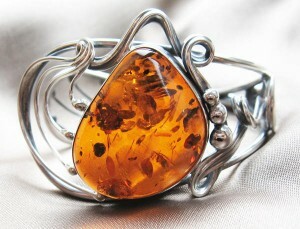 Well, amber is special itself, but imagine how special hand-carved amber jewelry and amber art are. Inclusions and stone color add a certain air of uniqueness to the amber piece, so hand-carved art can only benefit the owner even more. They are manifestations of human creativity and talent and each possesses the artisan or craftsman's personal touch and passion. Hand-carved amber figurines and jewelry items also come in unique pieces, so they have no duplicates. 10. What does Baltic Amber do? Benefits of Baltic Amber include significant inflammation reduction and thyroid gland stimulation, meaning less red cheeks or drooling for your teething baby. Amber is associated with warmth and sunlight, so it accelerates the body's natural immune system and the ability to heal wounds quickly. It also reduces other inflammations such as those affecting the ears, throat, stomach or respiratory system. 11. Does amber have a chemical constitution? Of course, since amber stones are in constant metamorphosis. Amber consists of 79% Carbon, 10.5% Hydrogen and 10.5% Oxygen. 12. Do scientists do research on Amber? Amber and Baltic Amber fascinate the scientific world thanks to their high succinic acid constitution. Robert Koch, a Nobel-prize winner and also pioneer of modern bacteriology, analyzed amber in 1886, confirming its positive effects. He also discovered that succinic acid present in the human body is risk-free. More recent research shows that succinic acid contributes to the wellbeing of the human body, as it strengthens the immune system and the internal organs and generates energy and balance between human body acids. Also, micronized amber is assimilated by people with high stress levels and blocked energy-related processes in cells. Amber stimulates cell and energy renewal. 13. Is succinic acid found only in Amber? No, but most of it is found in Amber. There are some plants which contain succinic acid, but usually it is deficient in nature. Succinic acid became indispensable in certain ingredients used in food processing. Plants with succinic acids, such as rhubarb stalk and unripe gooseberries, now have 1000 times less, so amber remains its primary source. 14. How long does an amber teething necklace last? Artisans and craftsmen usually create very durable teething necklaces and amber itself is a durable material. In many cases, the necklaces are handed down from one generation to another.